Sporting event tickets, Sports paraphernalia, etc. Check out the 2017 auction catalog! If you have an item/event to donate, please contact Robin Lai. The Silent Auction will be open for bidding from 8:30am - 1:00pm on the day of the Walkathon. The Auction Team is working diligently to procure a wide variety of wonderful donations from local businesses and West Valley families, teachers, and staff. Many hours are spent working to create items that appeal to the wonderful variety of tastes, styles, and personalities in our community. Please take a moment to find something you like. Items will all be available for you to bid on throughout the event. 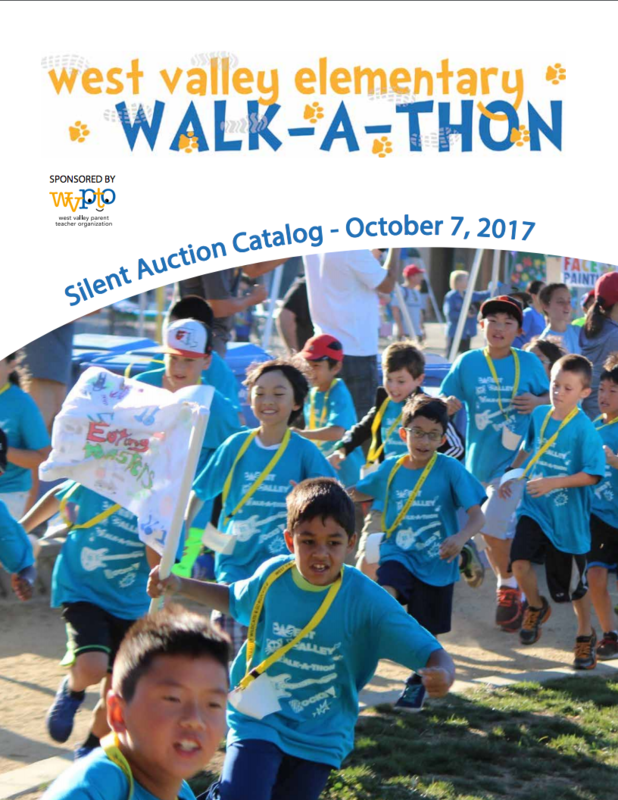 Please check back in late September to download a copy of our Silent Auction Catalog. You must be 18 years or older to place a bid. You must be 21 years or older to place a bid on any item that includes alcoholic beverages. NOTE: You do not have to be a student at West Valley to bid on an item. The Raffle will be open from 8:30am - 2:00pm. Winners will be announced at 2:00pm on the day of the Walkathon. There will be lots of wonderful baskets filled with exciting games, gift cards, sporting equipment and more so come out and buy raffle tickets and try to win one of these great prizes.